Describe 5 aspects of anatomy of the human body including 4 types of connective tissue, properties of skeletal muscle, properties of cartilage, properties of joints, and types and properties of bone. Discuss anatomy of the shoulder including 4 joints and 12 muscles. 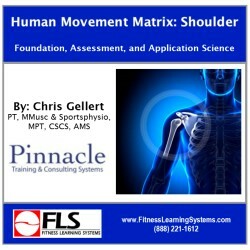 Explain shoulder biomechanics including scapulohumeral rhythm and 6 movements of the shoulder. Identify 7 shoulder daily activity movements. Explain 4 functional assessments for the shoulder. Discuss shoulder weak links in 4 sports. Identify 5 common causes of shoulder dysfunction. Describe 12 common shoulder conditions.